With these announcements, Facebook is envisioning technology that is far in advance of anything currently possible. To achieve sophisticated brain control with today's technology requires the implanting of a computer chip into the brain, something Ms Dugan joked "simply won't scale". There are already external brain-control technologies on the market, but these are simplistic in comparison. Electroencephalogram tech - known as EEG - can monitor electric impulses in the brain, but only for very basic, structured output - such as moving a dot up or down a computer screen. 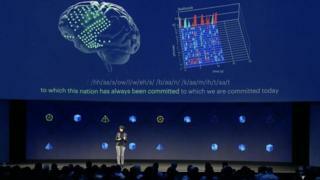 "We'll need new, non-invasive sensors that can measure brain activity hundreds of times per second," Facebook said in a statement. "From locations precise to millimetres and without signal distortions. Today there is no non-invasive imaging method that can do this."